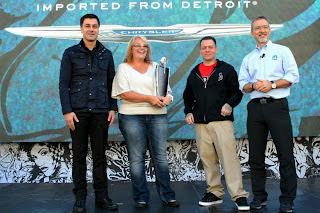 West Coast Customs Owner and CEO Ryan Friedlinghaus, named Oriana Schooley among the three finalists as the winner. The Chrysler Custom Challenge charged fans to submit an image of their customized Chrysler brand vehicle along with a brief description of what customizations they have given to their vehicle to make it unique. Their vehicles are also being featured on the SEMA showroom floor within the West Coast Customs display. "The Chrysler Custom Challenge provided Chrysler car enthusiasts a chance to creatively express their skills and passion for customization," said Chehab. "And SEMA's show floor provided us with the perfect stage to announce the winners and have their vehicles recognized and displayed at the show and online."